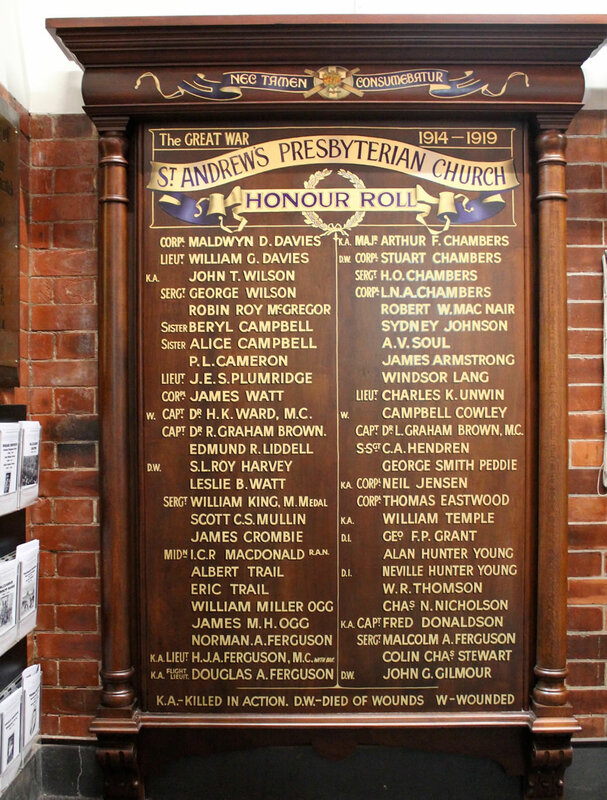 Robert Walker McNair whose name appears to be misspelt ‘MacNair’ on the Presbyterian Honour Board in the Merrington Anzac Memorial Peace Chapel in Saint Andrew’s Uniting Church, Brisbane, was born in 1879 in Perth, Scotland. His parents were Peter, a tobacco spinner – he made cigars, and Catherine. Robert was the youngest of six children listed in the 1881 census. It was his mother that he named as his next-of-kin. In 1912 he was one of the 311 passengers who sailed on the SS Dorset from Liverpool to Brisbane. He settled in Queensland and in 1913 was living at Parsons Point about 5km from Gladstone where he was employed as a shorthand typist. By 1915 he had moved to Brisbane and lived at 425 Boundary Street again working as a shorthand typist. In late March 1916 McNair enlisted in Brisbane into the 8th Field Artillery Brigade Headquarters with the rank of Staff Sergeant, was given the number 19551 and posted to Maribyrnong in Victoria before embarking on HMAT Medic which sailed from Melbourne on 20 May 1916. Disembarking in Plymouth he was attached to the Anzac Section 3rd Echelon BEF which after additional training sailed to France on 8 January 1917. General Headquarters, British Expeditionary Force (GHQ BEF) acted as the highest command for the British Forces in France, as well as those troops of other nations attached to the British forces, such as the Australians. It was commanded first by General Sir John French, and then by Sir Douglas Haig. In the early part of the war, GHQ had to move about. To make this easier, parts of the headquarters with purely administrative functions not related to GHQ's function as a command post were separate and located at Le Havre. This part of GHQ was known as the 3rd Echelon and an Australian section was attached to it which concerned itself mainly with record keeping, pay and postal matters. This posting would have enabled McNair to use his pre-war training and experience. His record shows that he had two periods of leave – 27 August 1917 to 6 September 1917, and 6 September 1918 to 20 September 1918. On 12 November, the day after the Armistice was signed, he was transferred from the 3rd Echelon to Administration Headquarters in London. He was granted non-military employment leave from 20 June 1919 to 29 October 1919 to attend Hugo’s Language Institute in Oxford Street London where he studied French, Spanish and Accounting. On 19 December 1919 after presenting a guarantee of employment from A. & W. Clark, House Factors and Insurance Agents of Partick in Glasgow and a letter from his mother advising that it was her desire that he should be discharged in England as he had no dependants in Australia, Staff Sergeant Robert McNair was discharged with the 1914/15 Star, the British War Medal and the Victory Medal. He returned to Australia and died on 6 September 1960. At that time he lived in Seven Hills in Western Sydney. He was defined as a retired public servant. He apparently had no family and his estate was shared equally between two friends, Barbara Jolly and Pamela Joy McElroy.